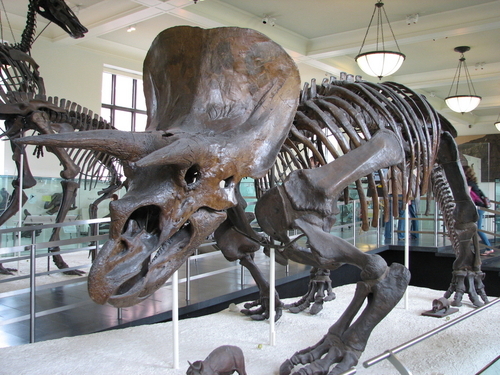 The Triceratops (from the Greek for “three-horned face,” which makes you wonder at the foresight of someone including that word in a Greek dictionary 2,500 years ago) was a massive herbivore of the Late Cretaceous Period that inhabited Western North America. Weighing as much as 12 tons and reaching up to 30 feet in length, the Triceratops was a very large dinosaur, and, if the fossil record is to be believed, it was also among the smelliest. Little is really known about Triceratops. 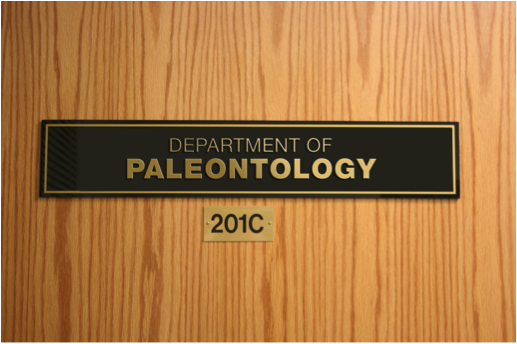 As always, that’s caused no hesitation in wild speculation on the part of paleontologists. 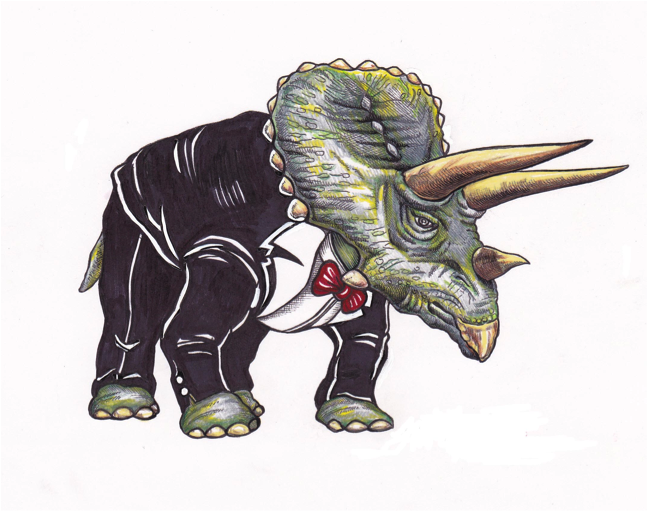 For instance, it is now argued that while Triceratops was once believed to live a solitary life, they actually lived in herds. The fossil record is used here, one assumes, despite the fact that a complete Triceratops skeleton has never been found. This is why nobody has ever seen fit to consult paleontologists about anything that might actually matter. They’ve also got a theory about male pattern baldness. 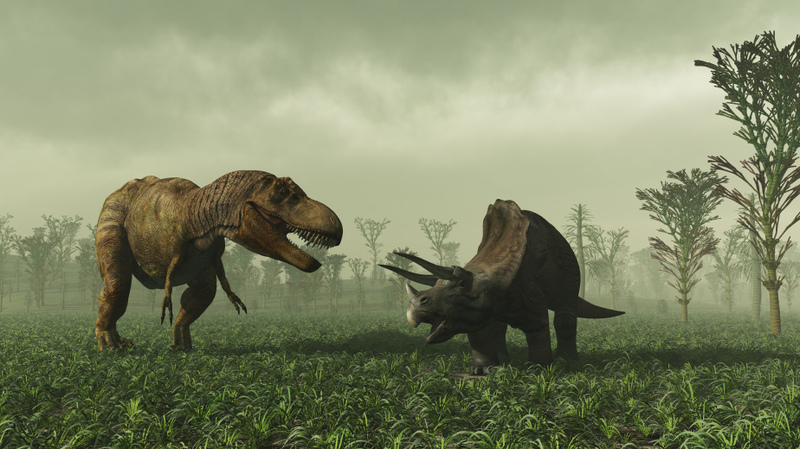 Some things that do seem to pass past mere speculation include the belief that Triceratops had four limbs (so far so good), the fore limbs being shorter and having five hooves (OK, cool) and the rear limbs being longer, with four hooves (nice job, everyone). They also had strong bodies (sure…) and the largest skulls of any land animal, ever (except the ones we haven’t found yet). Apparently they also had thick skin (hey, why not). At any given time, they had between 430 and 800 teeth (important for attacking surfers). Despite being herbivores, they were quite ferocious (wha….?). And they also almost certainly hated wearing tuxedos. One thing is for sure: Triceratops had three large horns, one above its nostrils and the other two were above its two eyes. These were as long as hockey sticks and may (or may not) have been used to knock down trees to eat or – let’s hope – fighting Tyrannosaurus rex. They battled for the love, for glory, and for freedom. Or not. Given what we know (and don’t know), the Triceratops certainly seems impressive: massive, horned, and possessed of one of the most beautifully melancholy mating songs in history (maybe).